Vets in Colorado say dog marijuana intoxication is becoming a bigger problem. 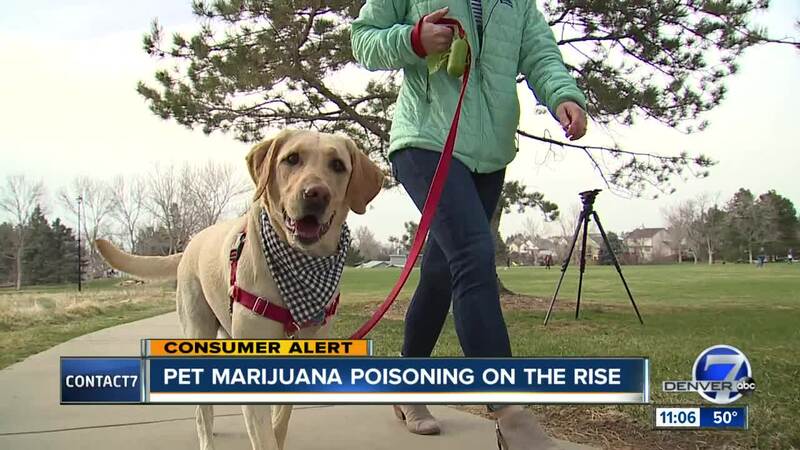 HIGHLANDS RANCH, Colo. — Veterinarians in the Denver area are warning pet owners about a growing number of animals that are being poisoned by marijuana. In some cases, dogs find edibles on the ground in parks. Just over a week ago, we brought you the story of a Longmont woman whose vet said her dog's strange behavior was likely due to marijuana . This week, a Highlands Ranch woman is coming forward to tell a very similar story. Holly Hilborn took her 2-year-old lab Lily on a walk at Kistler Park in Highlands Ranch. During that walk, Hilborn said Lily ate an unknown object. “About two hours later, she was not really putting weight as much on her back legs. We thought maybe she hurt her leg," Hilborn said. "Then she started just acting really tired — her eyes looked really glazed over and then we just kind of rested with her for a little bit and then she started leaking urine." Hilborn said she took Lily to an animal hospital where veterinarians diagnosed her with marijuana intoxication. “When they came in and asked us if she had any exposure to marijuana, we were shocked that that was even a possibility," she said. "We don’t have any of that in our house." Hilborn said she assumes Lily ate a marijuana edible on their walk. “We were kind of angry at first," she said. "We just wanted to get the word out to other people in the neighborhood that have dogs and children running around so that other people wouldn’t be at risk of that happening." Veterinarians at VRCC Veterinary Specialty and Emergency Hospital told Denver7 that ever since marijuana was legalized, they have seen more cases of marijuana intoxication compared to past years. "We see multiple cases a week," said VRCC Dr. Luke Rump. "Sometimes we see three a night, sometimes we see three a week… The ASPCA, which is the poison control, has seen a 300% increase in calls since it’s been legalized." Rump said after some fluids and rest, most dogs recover. But those who consume big doses of THC need additional care. "Half the dogs, we end up hospitalizing to help them," Rump said. Lily was not hospitalized and after one day, she made a full recovery. "We need to do more training with her to get her to drop things more easily and not just swallow things," Hilborn said. Hilborn said now she's asking anyone who consumes edibles to be mindful of where they can end up.